Location! Location! Location! Spectacular views of Nantucket Sound from almost every room of this beautiful, 2003-built, direct oceanfront home...with your own private beach too! This turn-key, year-round, beach getaway has both upper & lower level decks facing the ocean, with views that will take your breath away! With 3-bedrooms/2-baths, this Contemporary-style home has an open floor plan downstairs & a full-floor upstairs master suite with a ''crow's nest'' viewing area. Whole-home audio system. Back-up gas generator. Hurricane windows. On-demand hot water. Central A/C. Passed septic. This home is being sold with most major furnishings, kayaks, paddleboards, etc. Flood insurance is $589/year (fully assumable by next owner). 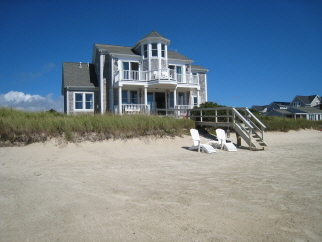 A wonderful year-round/summer getaway and/or rental investment!